The “Big Four” leaders of the House Transportation & Infrastructure (T&I) Committee, and the Senate Environment & Public Works (EPW) Committee, each wrote exclusive guest columns for the January-February issue of ARTBA’s “Transportation Builder” magazine. We are reproducing these columns in Newsline. 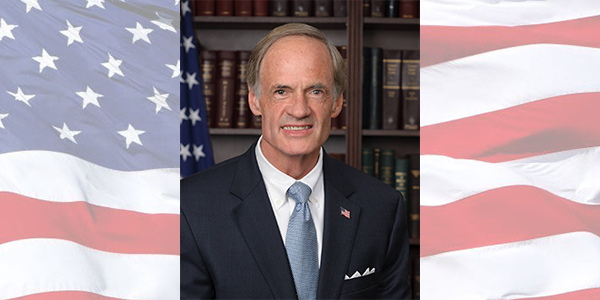 Sen. Tom Carper is ranking member of the Senate Committee on Environment and Public Works. We have gaveled in the 115th Congress in a particularly partisan era. The issue of transportation, though, can, and often has, united us. Building up our country’s infrastructure allowed Americans to dream big as we worked to connect people from coast to coast. Now, we have an opportunity to revitalize that system and reimagine how people and goods move across this country. As we look for shared priorities across the aisle, I believe that the need for significant, longterm investment in modern, resilient roads, highways, bridges, transit systems and other critical elements of our physical infrastructure is important to a vast majority of Americans. People from all different walks of life understand the need for investments and common sense solutions that will help get people to work and to school more easily and safely, while also moving goods more efficiently. Unfortunately, communities today are relying on decades-old infrastructure built by past generations to meet the needs of yesterday. These facilities no longer satisfy the needs of a significantly larger population or our greater shipping demand. From the fuel we waste sitting in traffic and damage to our vehicles to the far more serious cost of human lives lost in traffic crashes, deteriorating, inadequate roads, highways and bridges cost Americans close to $200 billion per year. The deteriorating infrastructure of the past is not just a threat to both safety and economic growth, it also presents an opportunity to invest in 21st century assets that will take advantage of new technologies and pave the way for even greater innovation in the days ahead. We know how to meet these challenges. Congress must provide a major increase in direct federal funding to states and towns in order to fix their crumbling roads, bridges, transit, rail, and ports and to begin work on the innovative solutions that will improve mobility and quality of life. This spending should be directed first toward maintaining the critical assets that are already derelict or are carrying more people than they were designed for. Maintenance projects are one of the most impactful investments, and we have a duty to safeguard the assets that millions of Americans already rely upon daily. Funding must be multimodal and provide flexibility for local leaders to identify the unique and creative solutions that are appropriate for their challenges. We also need to make sure that investments are made in a way that promote accountability and create the greatest value for each dollar spent through transportation planning that ties investment decisions to locally set performance targets. Expanding the highly successful TIGER program is one way to ensure that local leaders have direct access to federal dollars and identify the best possible projects through the competitive grant process. National leaders must also recognize and correct our ongoing failure to provide sufficient and reliable funding for projects that are complex, multi-jurisdictional or mega-regional in scope, and will produce significant benefits for the national economy once completed. Finally, I believe that any proposal to invest in our country’s infrastructure should create a path toward long-term solvency of the Highway Trust Fund. There is a tradition in our country that the users, businesses, and others who benefit from the infrastructure help to pay for it. Revenue from gasoline and tire taxes have historically enabled investments in roads and transit, and have built the system on which we now rely. However, over the last two decades, these taxes have not been increased even to keep pace with inflation or the rising costs of construction, and, therefore, their revenues no longer meet our investment needs. There are many options as to how to update these revenue streams in order to pay for much-needed investments – whether it is through indexing existing taxes, or identifying new revenue streams tied to things like freight movement or vehicles. What is clear, though, is that we have a real opportunity to transform our infrastructure, and I believe the time to act is now.